Fiction|Reality was formally one of several outcomes of Anders Paulin's research project Non Mimetic Performativity at the Danish School of Performing Arts 2014-2016. The conference gathered 150 people from early morning to midnight for 4 days. Participants came from the field as well as art educations in Denmark, Sweden, Finland and Norway. The program was a mix of various conversation formats and performances, focusing on the interaction between aesthetics and their discursive potential. The conference departed from a series of conversations, divided in two main trajectories: Aesthetics as Practice and Aesthetics as Organisation. Parallel to the conversations, some of the central notions will be elaborated in keynote-dialogues (follow the schedule). 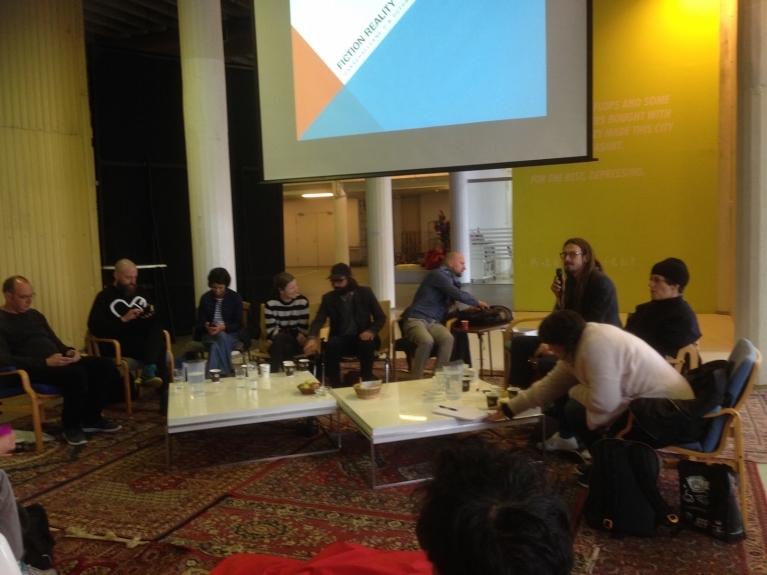 Thursday and Friday morning we began with an open round-table conversation between the invited team of artists and theorists, followed by a Q&A. Friday afternoon and Saturday morning we expanded the conversations to be continued and elaborated between all participants in 10 groups, each moderated by one from the team. For each day we asked all participants to prepare a reflection, question or concern addressing the respective thematic point of departure of the conversation groups. The spectacle presents itself as a vast inaccessible reality that can never be questioned. Its sole message is: ‘What appears is good; what is good appears.’ The passive acceptance it demands is already effectively imposed by its monopoly of appearances. The quality and long-term sustainability of any society or community is dependent on its ability to reflect on the relation between that what-is and what-is-not, on its collective strategies to imagine and negotiate with its inherent abjects, the subjectivities only possible as absence. In todays economy of accelerated exhibition - where the constant stream of appearances and displayed imagery of subjectivity, differences and multitudes is the key propellant of an apparatus operating in the paradigm of an instrumentalized desire of “the new”; where time is understood as a continuous and linear progress, inevitably inscribing and projecting all our fantasies and dreams into the immanence of a prefigured future - we maybe begin to experience the full meaning of Guy Debord’s central notion “What appears is good, what is good appears” In its simplicity, this worm-hole logic of the self-representational spectacle constitutes a contemporary paradigm of the present re-presenting itself as presence. Whatever can be rendered appearance is part of what is present, of what “exists”, and this self generating repression of the presence over the absence is pushing all positions of abjects even further into invisibility. In this context, aesthetic strategies to address the invisible, i.e. tools and means to create collective imageries of that what can only appear as absence, become a central challenge. What is the relation between my aesthetic practice and the world? And in what way does my practice inscribe itself in a symbolic order of power, as defined by the interaction between aesthetic and political representation? What tools - aesthetically and politically - do we have at our disposal to fantasize and produce collective imaginaries of that what can not appear as presence in our present reality? And, not the least: How does a subject (re-)present itself, make itself appear and gain agency in the present, without being subjugated to the symbolic order guarding the territory of that presence? A recurring figure in Hannah Arendt’s work is the description of public realm as a space of appearance - a space where I appear to others as they appear to me. The institution understood as public space in this logic would be a venue where my subjectivity is negotiated in the encounter with others. Contrary to this, the task of contemporary cultural institutions increasingly is to provide “the audience”, mainly defined as a consumer target group based on the majority culture, with recognisable and identifiable representations of their reality. The aesthetic apparatus is there to simultaneously educate and confirm the taste, ethics and interest of this majority; a process of identification and affirmation, based on the idea of common sense as the lowest common denominator - that on what we can agree without discussion. This is the opposite of the “enlarged mentality” as described in Kant’s notion of sensus communis, where common sense is understood as an agreement reached only through a negotiation between a multitude of independently thinking, critical subjects. Whether we talk about institutions and public space in the context of education, art or politics, this sliding of meaning, the gradual turning inside-out of the function inherent to the notions of common sense and spectator, is at the core of what could be described as a current crisis of public space. In this anti-production of aesthetics, to use Pristas’ phrase, artistic labor is instrumentalized in the continuous manufacturing of art and politics as objects of desire, following the logic of economy in which fundamental social functions and needs can generate capital insofar that they are not satisfied. Bojana Cvejić, Goran Sergej Pristaš, Mette Edvardsen, Katya Sander, Efva Lilja, Anders Paulin, Paula Caspao, Fredric Gies, Johan Forsman, Rodrigo Sobarzo de Larraechea, Sara Gebran.